We had a lot less riders last weekend than most weekends this winter. The ones that rode reported better than expected conditions. Right now we have a daily thaw then freeze cycle going on. That leaves the top of the snow icy, but the sun and warm weather thaws it out again. In the case of my driveway the water is adding up between the snow piles and flooding it, which freezes overnight. What a mess. Right now I am getting in and out on the snowmobile and leaving a car down by the road. It is impassible for vehicles. I am not the only one with flooding issues as the big snow melts. There are many reports of flooding on the trails and otherwise. This week looks warmer than normal. We are looking at low 40s today, mid-40s Tuesday and Wednesday, upper 40s Thursday, 50 and sunny Friday, and mid-50s Saturday and Sunday. The sun is a snow killer at this time of year. It is supposed to be sunny from Wednesday to Sunday. Wednesday is the vernal equinox, when the day and night are each 12 hours. It is also the first day of spring. The area clubs have stopped grooming at least temporarily. Between the flooding and the soft snow it is not an option. If it sounds like our season is circling the drain with increasing velocity you aren’t alone. There will be riding opportunities for a while yet with the big snow pack, but soon it will be in select areas that take the sun and warmth better. This has been an amazing year with all of the snow. 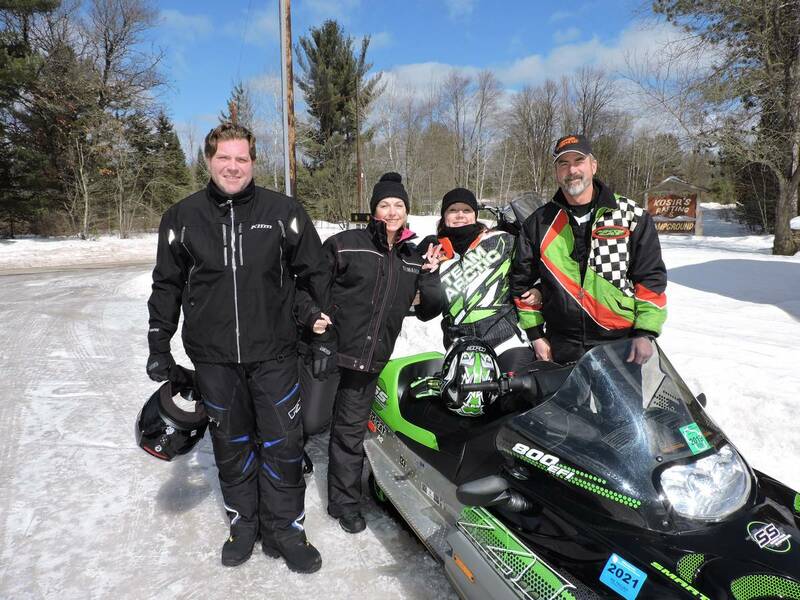 Rhinelander broke the all time record for snowfall. The old record was 110″. To have this happen in an El Nino year is beyond amazing. Usually El Nino winters are really bad. This one broke the rules. Now we are dealing with all of that amazing snow making an amazing mess as it thaws and floods everything. The only good that I see in that is that we are in for one heck of a spring whitewater season. I am off to brave the driveway and head to work. Have a good week and thank you for visiting! 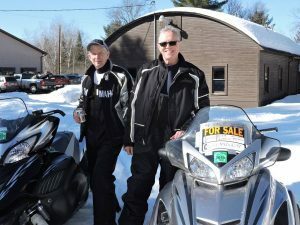 Here are a couple of pictures of riders that came to visit.